Goodtime Medical, Inc. has a selection of seating including exam stools, waiting room chairs, children’s and reception seating and office furniture. 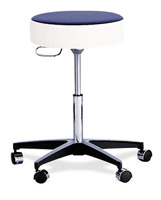 Our exam stools are available in Spin Lift and Pneumatic. A spin lift stool features 2” rubber wheel ball-bearing casters, stable 19.5” 4-leg ‘S’ style chrome base, 14” wide poly-foam seat cushion and machine screw height adjustment. The Pneumatic stool a 5 star base, height adjustment 17.5“- 24.5“,16“ poly-foam seat cushion, chrome hooded dual-wheel casters and optional adjustable back rest or 18” adjustable chrome foot ring. Choose your color: red, blue, yellow or Dalmatian.